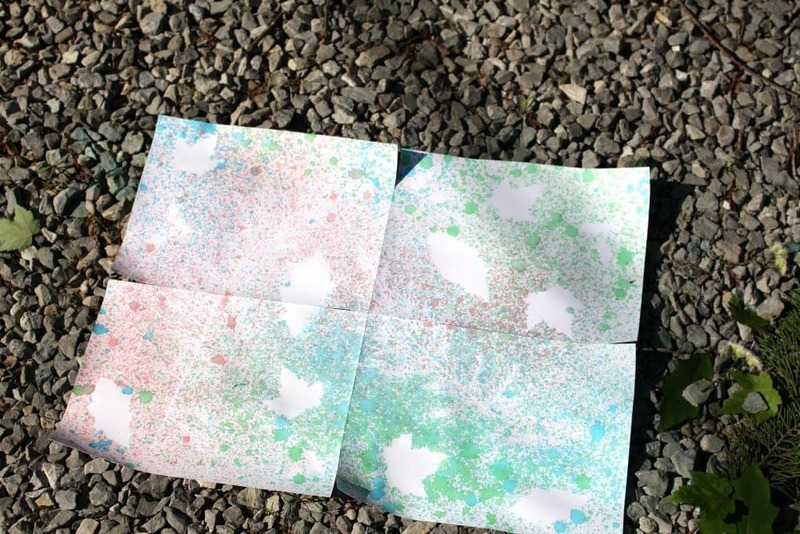 This great kids’ art project provides a creative outlet for outdoor fun! This spray bottle nature art project is easy to set up and uses simple inexpensive supplies. There is also a fun and easy science extension! When incorporating nature into art, the possibilities are truly endless. Begin by mixing your spray bottles. If possible use clear spray bottles, so your kids can see which color is in the bottle. To mix, add about a cup of tap water to the bottle. Then, add drops of food coloring to the bottle and shake. Continue adding food coloring until the spray is as dark as you want it. This is personal preference and will require trial and error. I used a scrap piece of paper to test the spray until I was satisfied with the result. Next, take a nature walk and collect a variety of items, such as sticks, small branches, leaves in different shapes, wild flowers, acorns, pine cones, and stones. You can begin with 1 sheet of paper, or tape a few sheets together to create a larger canvas, like we did. Once the paper is ready, have your kids arrange their collected nature items on the paper however they like. When we completed the project, it was a little windy, so we used some small rocks to prevent the lighter items from blowing away. Next is the fun part. With the collected items in place, use the spray bottle to spray color all over the paper in an abstract manner. The kids can get as crazy as they want with this. There is no right or wrong. They can spray as much or as little as they want. After spraying, allow your paper to dry. Then, remove the nature items and admire the beautiful creation. Once of the neat things about this activity is that you really aren’t sure how well an item will work, until after the project is complete. As you can see, our pine branches didn’t do so hot. For a fun science extension, use this nature art printable observation sheet to keep a record of which items resisted the spray paint the most. If you choose to do the science extension, be sure to have your children make a hypothesis (educated guess) before hand, as to which items will stop the paint and which items won’t. When you are finished with your nature items, you can reuse them for another science project, Sorting Parts Of A Plant, by Munchkins and Moms. Happy learning! Any ideas for 3rd grade fraction lessons?